The following project report was produced by the University of Maryland’s research program with the Department of Homeland Security called the National Consortium for the Study of Terrorism and Responses to Terrorism (START). 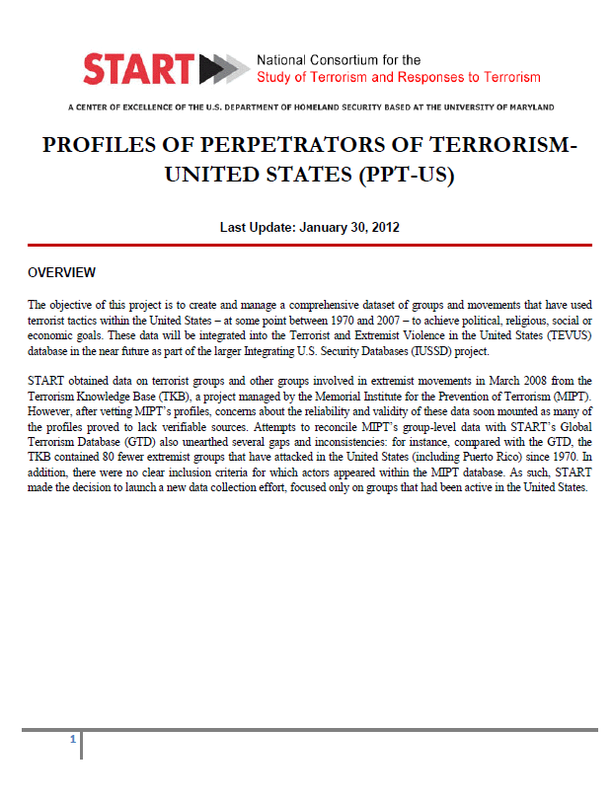 The Profiles of Perpetrators of Terrorism – United States (PPT-US) project concerns an effort to create a “comprehensive dataset of groups and movements that have used terrorist tactics within the United States – at some point between 1970 and 2007 – to achieve political, religious, social or economic goals.” The project produced a report from the dataset earlier this year titled “Hot Spots of Terrorism and Other Crimes in the United States 1970 to 2008” that has been criticized for its identification of overly-broad psychological traits as being associated with terrorism or terrorists who have acted inside the U.S. For example, the report contains a section stating that being “fiercely nationalistic”, “suspicious of centralized federal authority”, “reverent of individual liberty” and believing in conspiracy theories are all traits that belong to “Extreme Right-wing” terrorists. According to the report, the following project was the source for defining these “ideological motivators” of specific terrorist groups. The objective of this project is to create and manage a comprehensive dataset of groups and movements that have used terrorist tactics within the United States – at some point between 1970 and 2007 – to achieve political, religious, social or economic goals. These data will be integrated into the Terrorist and Extremist Violence in the United States (TEVUS) database in the near future as part of the larger Integrating U.S. Security Databases (IUSSD) project. START obtained data on terrorist groups and other groups involved in extremist movements in March 2008 from the Terrorism Knowledge Base (TKB), a project managed by the Memorial Institute for the Prevention of Terrorism (MIPT). However, after vetting MIPT’s profiles, concerns about the reliability and validity of these data soon mounted as many of the profiles proved to lack verifiable sources. Attempts to reconcile MIPT’s group-level data with START’s Global Terrorism Database (GTD) also unearthed several gaps and inconsistencies: for instance, compared with the GTD, the TKB contained 80 fewer extremist groups that have attacked in the United States (including Puerto Rico) since 1970. In addition, there were no clear inclusion criteria for which actors appeared within the MIPT database. As such, START made the decision to launch a new data collection effort, focused only on groups that had been active in the United States. A group or movement is included in the PPT-US if it is identified in the Global Terrorism Database as having launched at least one terrorist attack against targets within the United States homeland. PPT-US only includes groups that have at least one incident for which there is no reservation, in the eyes of GTD analysts, that the incident in question is truly terrorism (as opposed to non-terrorist violence or crime) and for which there is high confidence that the accused group is in fact responsible for the attack. Extreme left-wing groups want to bring about change through violent revolution rather than through established political processes. In addition, this category includes secular left-wing groups that rely heavily on terrorism to overthrow the capitalist system and either establish “a dictatorship of the proletariat” (Marxist-Leninists) or, much more rarely, a decentralized, non-hierarchical sociopolitical system (anarchists). The “New Left” movement is synonymous with the so-called Hippie movement and college campus protests of the 1960s and 1970s. Rather than focusing on issues of social class and labor unionization, the New Left focuses on a broader range of reforms. The extreme far-right is composed of groups that believe that one’s personal and/or national “way of life” is under attack and is either already lost or that the threat is imminent (for some the threat is from a specific ethnic, racial, or religious group), and believe in the need to be prepared for an attack either by participating in paramilitary preparations and training or survivalism. Groups may also be fiercely nationalistic (as opposed to universal and international in orientation), anti-global, suspicious of centralized federal authority, reverent of individual liberty, and believe in conspiracy theories that involve grave threat to national sovereignty and/or personal liberty.